In late November 2017 the Nord Stream 2 has been blamed by the U.S. Department of State for being Kremlin’s weapon of political blackmailing, which soon could be torpedoed by the U.S. sanctions against Russia[i]. 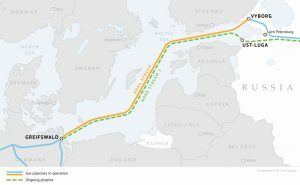 The Nord Stream 2 gas pipeline is the new route for gas transit that Russian Gazprom and its European partners – OMV, Engie, Royal Dutch Shell, Uniper and Wintershall – plan to build through the Baltic Sea to Germany. It has been criticised for threatening energy security of Russia’s Western neighbours, in particular Ukraine and Poland. However, since recent U.S. bill on sanction in July 2017, the project itself is to the great extent under the threat of falling apart. The Nord Stream 2 gas pipeline is a new pipeline designed to export gas to Europe, which largely follows the route of already existing Nord Stream pipeline. It is expected to become operational before late 2019. 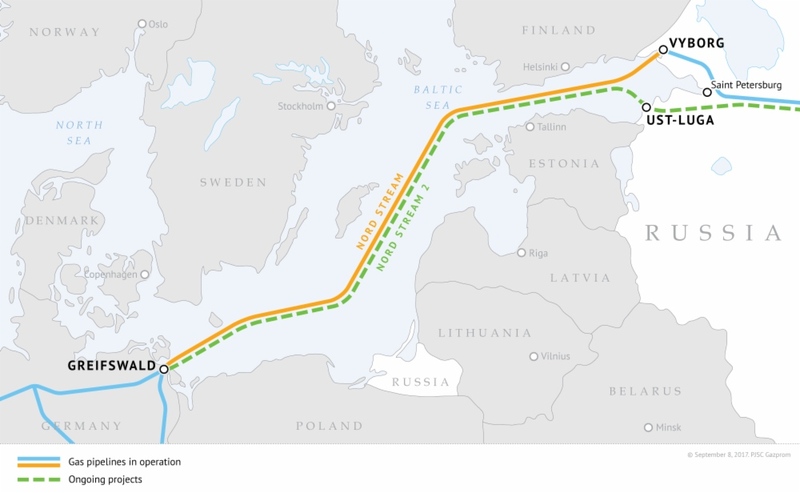 The new gas route will be over 1,200 km long running through the Baltic Sea from Russia to the landfall near Greifswald in Germany. 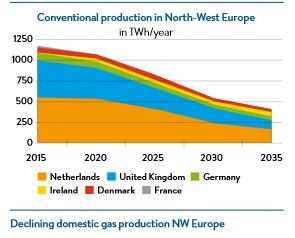 This way, natural gas will enter the internal energy market of the European Union connecting to other pipelines for further transportation. The decision behind constructing the second Nord Steam pipeline came after a successful construction experience of the first Nord Stream as well as due to the Ukrainian-Russian difficulties in energy cooperation. The new route is, thus, supposed to ensure a reliable supply of gas from Russia to Europe through establishing a direct connection between Gazprom and the European consumers, with the capacity of 55 billion cubic metres of gas annually. Thereby, total capacity of the Nord Stream 1 and 2 pipelines combined would equal to 110 billion cubic meters annually. The fact that Europe faces a decline in gas production and its rising demand for gas imports also play an inalienable role in building the Nord Stream 2. Although the commercial case for the project is quite clear on where it aims to continue the energy deal between Russia and the European Union, the Nord Stream 2 project has a lot of bias and many states see its geopolitical dimension. The European Commission passed amendments to the Gas Directive that excludes the need for new pipelines because by 2030 the European Union aims to reduce its demand for gas in favour of the renewable energy sources. Thereby, even with the reduction of domestic gas production the volume of gas imports to the EU will not largely increase, which makes the existing transit routes through Germany, Ukraine, and Belarus sufficient enough to transport gas from Russia to Europe. This leaves the new expensive construction with limited sense, forcing question why would the Russians need to spend an enormous amount of resources for an unnecessary infrastructure. According to numerous studies, the Nord Stream 2 project would increase influence of Russia over its neighbours by using energy exports as a coercion tool, and would eventually have an affronting impact on the European energy security. The new infrastructure is rather an alternative route for existing gas pipelines than an option for bigger opportunities, if only for Gazprom. Indeed, the company has stated its intentions to stop supplies of gas through Ukraine by 2019 due to the country’s questionable transit reliability. This is of course disingenuous, since Russia itself is responsible for majority of cut-offs to Ukraine and the EU (2014/2015: it stopped gas transmission to the EU in order to stop reverse flows of Russian gas back into Ukraine). Furthermore, following the impact of military conflict, one sees that Ukraine can keep the gas going westwards in the most difficult circumstances, thereby country’s transit reliability can hardly by questioned. Instead, the final impact of the Nord Stream 2 for Ukraine would be dramatic because of the loss of transit fees. First of all, this would weaken economy of the country significantly: according to Naftogaz, Ukrainian state owned gas company, transit fees on Russian gas account for nearly 10 percent of Ukraine’s GDP. Secondary, the Baltic Sea project would decrease the encircled energy security of Ukraine as well as, finally, undermine policy of the EU towards Kiev. Finally, the Baltic Sea project is a great opportunity for Russia to overcome imposed sanctions: Russia is financing about a half of the project and although, at the moment, it somehow works around sanctions, in order to fully meet its financial obligations, it consequently would need to access the rest of its funds. The European Union’s energy security under the project becomes highly questionable too. About 80 percent of Russian exports of gas to Europe would flow directly to Germany through a single set of pipelines. With the Nord Stream 2 construction, Gazprom gets a monopoly over the EU gas supplies where it will be able to both, transport and sell gas to European consumers at the same time. Furthermore, following the issued legal opinion by the Council on the European Commission’s proposal for starting negotiations with Russia on special legal framework for the Nord Stream 2, it becomes clear that a number of restrictions stated in the Third Energy Package – anti-monopoly of EU energy suppliers – would not apply automatically to the new pipeline. This would allow Russian Gazprom and its Western European partners to establish conditions for operating the pipeline in an unrestricted and free manner further disintegrating the European Union through favouring the supporters of the project, in particular Russia. The new route for gas transit will strongly influence gas supplies to Central and Eastern Europe. Poland, among other EU member-states, is in the most vulnerable situation receiving most of its gas from Russia (although, recently it has tried to diversify the gas supplies receiving imports from Qatar and a one-off shipment from the United States). Czech Republic, however, has some doubts: it tries to avoid a direct confrontation with Germany because of countries’ strong energy connection, but “if the Nord Stream 2 project were to be implemented, it would have to be in compliance with European law” – the official government’s position is. As of the other member-states, Denmark is very much concerned and threatens to ban the construction in its territorial waters; in such case, the construction route must be changed (likely to the north of Bornholm as in this situation, under the Convention on the Law of the Sea, a coastal state cannot block gas pipeline projects) and the costs will respectively rise. Following recently amended by Danish parliament law on the continental shelf, any investment now has to be in line with interests of Denmark, thus Denmark is hoping that the Nord Stream 2 decisions will be made by the European Commission, so that the country is not forced to block the construction alone. While the Baltic Sea project threatens some of the EU countries, others are strongly in favour of such changes, especially due to the financial benefits it would bring to their countries. Germany, Austria and a few others, in particular, are convinced the pipeline is a purely commercial project with no covered geopolitical purposes behind. The proponents of the project also assure it will not increase the EU dependency on imports from Russia but will only increase its energy security due to the direct gas connection with the supplier. What complicates the situation further, the Nord Stream 2 is fully owned by Gazprom and co-financed by five European energy companies: Germany’s Uniper and Wintershall, Austria’s OMV, Royal Dutch Shell, and France’s Engie. The total estimated cost of the project is 9.5 billion euros, out of which previously mentioned European companies are committed to cover 4.75 billion euros (10 percent, or nearly 950 million euros each). As a result, because the co-financing companies belong to the three biggest EU member-states with the biggest number of votes in the EU bodies, and considering the fact that those five companies have already provided 1.43 billion euros in total in 2017 for the construction of the pipeline, anything regarding project difficulties would likely be rejected and even blocked. So, requests of Donald Tusk, the Chief of the European Council, to the member-states to block the construction of the Nord Stream 2 gas pipeline would unlikely be efficient. Even if the majority does supports Brussels’ view on the issue, in order to prohibit the construction signatures of all EU members must be collected. Thereby, with France and Germany being strongly against the prohibition, currently the European Commission does not have power to immediately block the construction. Lesser of two evils, thus, seems the Commission starting negotiations with Russia on special legal regime for the Nord Stream 2 limiting the freedom of the project participants to act arbitrarily. This alternative does not have enough of support among member-states either – 13 of 28 members. Source: Karel Beckman, «The real story behind Nord Stream 2», The Baltic Course, October 12,2016. http://www.baltic-course.com/eng/analytics/?doc=124714. On the 25th of July 2017, the U.S. House of Representatives passed the new sanctions bill – “Countering America’s Adversaries Through Sanctions Act (CAATSA)” – stating that Russia is using energy exports to coerce its neighbours and, thus, the Nord Stream 2 clearly aims to undermine the EU energy security by leaving it reliant on a single supplier (the bill was passed by the Senate two days later). The public guidelines concerning CAATSA were adopted by the U.S. Department of State and the U.S. Department of the Treasury on the 31st of October 2017. So far, the legislation poses the biggest threat to the pipeline project, among others as its expands the range of economic sanctions against Russia imminently impacting also foreign energy companies cooperating with Russian concerns even outside of Russia. “The financing of such large infrastructure projects becomes almost impossible after the introduction of such sanctions” according to Rainer Seele, the CEO of OMV. The new legislation not only requires President go to Congress before he commits any actions in regard to sanctions against Russia, but allows Congress to sanction specific individuals for e.g. evading sanctions or cyber activity. In this light, latest American sanctions seem to be having a decisive role in the construction of the pipeline targeting both Russian and European companies, who cooperate with Russian counterparts, where further U.S.’ involvement might finally break down the entire idea of construction. Martin Schäfer, spokesman of German Foreign Ministry, said that it is “unacceptable for the United States to use possible sanctions as an instrument to serve the interests of U.S. industry policies”. According some European politicians, the bill uncovers so-called Washington’s hidden agenda that attempts to adjust large trade deficit of the U.S. with the EU. Starting to buy more of the U.S. liquid natural gas (LNG) Europe could potentially correct transatlantic balance of trade. Since 2016, only 1 billion cubic metres of U.S. LNG reached Europe – 2% of planned capacity of the Nord Stream 2. But Russia’s imposed energy sanctions automatically make American gas super attractive and welcomed energy source, especially that it would help to diversify Europe’s energy supplies away from Russia and lower significantly the bargaining power of Gazprom. Nevertheless, it is necessary for the European Commission to insist all this happens based on market supply and demand principles than based on simple energy mercantilism. 1. With the recent events one clearly sees what a great affect would the U.S. sanctions have on the overall implementation of the Nord Stream 2. Not only those can fully stop the construction, but can also – however – contribute to disunity between the EU and the U.S. on other matters, in particular decisions regarding the response to Crimea and Eastern Ukrainian conflict. 2. Choosing between Russia’s energy dependency and the U.S. LNG exports, American option so far seems the sanest one, especially for Eastern European member-states such as Poland and Lithuania. In fact, the first cargoes of American gas have arrived to these two countries in summer 2017, with Poland signing a five-year deal on LNG exports with the United States. This option is indeed an opportunity for Polish government to both, start diversifying Polish energy suppliers distancing country from reliability on Russian gas and strengthening its political ties with the States. Although few issues exist: infrastructure bottlenecks in Europe, where LNG terminals are capable of accepting small amounts of gas, and the price for U.S. LNG. Yet, from the perspective of European long-term security, American gas would surely cost much less than Russia’s control over 80 percent of gas supplies to Europe (compared to nearly 30 percent nowadays). Moreover, with the construction of the new pipeline Poland appears to be in the position of too high energy sovereignty risks. 3. Another smart option for the EU, and Poland as its integral part, is the investment in security and reinforced reliability of the Ukrainian gas pipeline. Ukraine, in turn, has to fully reform its gas market (full implementation of the Third Energy Package, privatising Naftogaz and establishing an independent regulator, upgrading surveillance and enforcement powers of the Energy Community on the territory of Ukraine). Finally, an international consortium based on the Ukrainian gas transmission network could be formed.